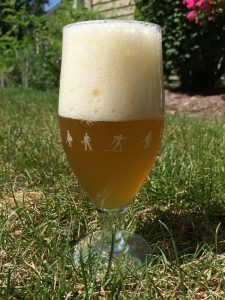 This is the fifth recipe version that I home brewed of Leaner Saison. It is the second time I have brewed Leaner Saison this year and the second recipe version. Not much difference but I keep tweaking. There is only a few unbelievable days each summer in Chicagoland. Today was going to be the second in a row: 75*F – 80*F with <40% humidity. Starting the home brewing process at 0600 with high skies is the perfect scenario for me. The sun hits the yard with those long angles, similar to the evening but riding on the hope of the days beginning rather then the solemn end. Lallemand Belle Saison yeast had been purchased a couple of weeks prior in anticipation of home brewing a saison. The taste for rye was in my mouth. I think it may be time for hoppy rye amber as well! 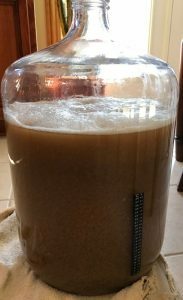 I purchased Azacca purposely for Leaner Saison after the success of the brew day earlier this year. Simplifying the last recipe version. It summer and a hoppy saison sounds darn delicious. Anticipation is high from end for this beer. 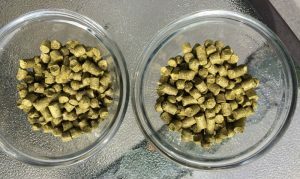 The upped level of hop usage along with how well it plays with the rye… Enjoy! 2018-07-07 evening: @66.7*F, added yeast. 2018-07-08 morning: @66.0*F, no visible fermentation. Useless Fact: Anatidaephobia is the fear that somewhere, somehow, a duck is watching you. Look: Pours clear. Pale straw to pale gold in color. Half a glass of pristine, white foam. Retention is average; bubbles become quite large. Lacing exists but all falls back to liquid level. Aroma: A good mix of scents meet the nose. Ripe tropical fruits, light spice with pear and gentle banana, seemingly from the yeast. Light grainy sweetness. Taste: Spice, sweet grain and yeast characteristics up front. The middle to the end builds the tropical fruit element, lingering into the finish. No real bitterness but lingering pepper. Drinkability: Medium body. Big carbonation. Crisp. Clean. Dry. Overall: I don’t why I have gone so long without brewing a saison. Reminds me that it is one of my favorite styles. I have been blinded by the hop. Easy to drink. Will make again. I might step this one up with a bit more hops: dry hop? I will have to brew saisons on a more regular basis. Enjoy! Useless Fact: An average person’s yearly fast food intake will contain 12 pubic hairs. Mosiac hops awaiting additions into the boiling wort. Lately, I have been brewing American Ales, more precisely, India Pale Ales IPA). I have strayed off the IPA beaten path but only to come back as the tractor beam of hop affection pulls undeniably. At my last visit to the home brew store I was easily persuaded into Lallemand Belle Saison yeast. Prior to that, I had purchased a 10 pound sack of rye. I had used it in Rye IPA earlier this month. I still had a lot left. The combination of the rye on hand, two versions of a rye Saison never brewed, and the slippery tongue of the beer salesmen, I was destined to pick up the saison yeast. The beer store also doubles as a brewery. Salesperson said that they use that yeast in their sasisons. I like there saisons. I don’t have to create a starter if I manage the “size” of the alcohol content. The yeast may sit in the fridge for a week or few months, it is dry yeast. Once again, easy decision. The only thing left to do: decide on the version of Leaner Saison to brew. Notice that I am using version “c”. I made a third recipe after looking at the first two. Those recipes were made a few years back when I was a bit more subtle in my approach of using rye in a home brewed saisons. It needed more rye: 3 pounds. It needed some new world hops: 3 ounces of Mosaic. Rye and tropical fruit saison, hopefully, here I come. 2016-07-04: @69*F, on heat to raise to 72*F.
2016-07-04: @72*F, raised to 74*F.
2016-07-04: @64*F, took off heat. 2016-07-17: bottled with 3.2 ounces of priming sugar and 1.6 cups of water. 19, 22 ounce bottles. Bottle crown label: Rye. 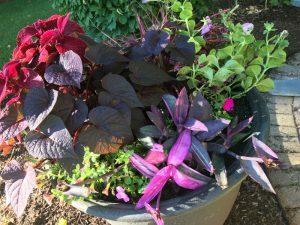 2016-07-17: 1 gallon placed on 23 ounces of services berries. Useless Fact: 93% of the Great Barrier Reef is now damaged by coral bleaching.